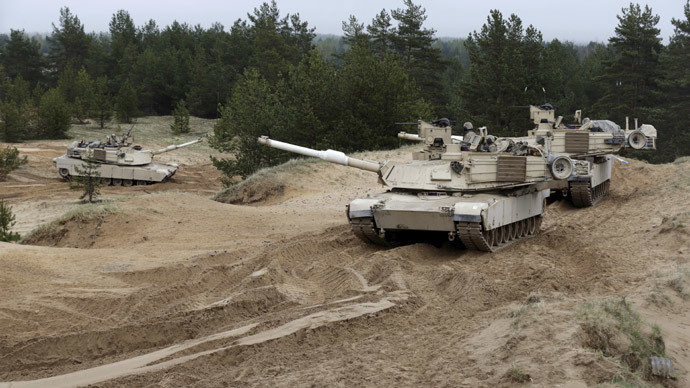 The Pentagon is reportedly poised to store battle tanks, infantry fighting vehicles and other heavy equipment for up to 5,000 US troops in Eastern European and the Baltic countries. It says the move is to reassure its NATO allies. According to the New York Times citing American and allied officials, the equipment would be stored in each of the three Baltic nations: Lithuania, Latvia and Estonia, as well as Poland, Romania, Bulgaria and possibly Hungary. The move, if it is approved, would be the most serious deployment of military hardware in Europe since the end of the Cold War; although the plan falls short of a permanent presence of boots on the ground. However, as a result of the Ukraine crisis, NATO and the US have decided to bolster forces in the region, which they say is to send a clear message to the Russian government that NATO will defend its alliance members. “This is a very meaningful shift in policy. It provides a reasonable level of reassurance to jittery allies, although nothing is as good as troops stationed full-time on the ground, of course,” James G. Stavridis, a retired admiral and the former supreme allied commander of NATO, who is now dean of the Fletcher School of Law and Diplomacy at Tufts University, told The New York Times. But the proposal still has some way to go before it becomes a reality, and requires approval from Defense Secretary Ashton B. Carter and the White House. It has also stirred concern among some NATO allies about the wisdom of the plan and Russian reaction to the deployment. Senior officials from some of NATO’s new members had recently requested in a letter to the alliance that US troops should also be stationed on their territory. “We need the prepositioned equipment because if something happens, we’ll need additional armaments, equipment and ammunition. If something happens, we can’t wait days or weeks for more equipment. We need to react immediately,” said Raimonds Vejonis, Latvia’s defense minister, who will become Latvia’s president in July. A Pentagon spokesman however insisted that no decision had been made about the relocation of US military equipment. Since Crimea’s reunion with Russia and Kiev began its military operation to quell unrest in the east of Ukraine last spring, NATO forces have stepped up military exercises along Russia’s border – in the Baltic States and Eastern Europe. Last week, the Russian President Vladimir Putin once again reiterated that Russia is not an aggressor and is not building up its offensive military capabilities overseas, but is only responding to security threats caused by US and NATO military expansion on its borders. “I think that only an insane person and only in a dream can imagine that Russia would suddenly attack NATO. I think some countries are simply taking advantage of people’s fears with regards to Russia,” Putin told the Italian newspaper Il Corriere della Sera. However, Moscow has on numerous occasions spoken out against a NATO build-up on its western borders, saying that such moves threaten Russian security and creates instability in the region.